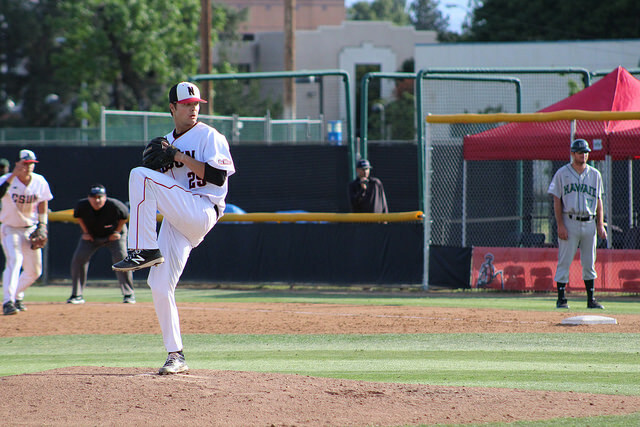 CSUN baseball rebounded from a three-game conference losing streak with a 2-1 win against Hawaii on Friday afternoon at Matador Field. Angel Rodriguez got the nod for his seventh start of the season and built off of his quality outing last week against UC Santa Barbara, where he threw six innings and allowed one run. Not much changed for Rodriguez during his start on Friday as he struck out five of the first nine batters he faced. “Each and every count whether I’m ahead or behind, having faith in my defense makes me execute what I need to do,” he said. Offensively, the Matadors stranded two baserunners in the bottom of the first after back-to-back base hits from leadoff hitter Yusuke Akitoshi and Justin Toerner. Both runners advanced on a double steal which placed them both in scoring position. The heart of the Matador lineup failed to cash in after consecutive strikeouts from Branden Berry and Albee Weiss to end the inning. CSUN threatened again in the second after loading the bases with zero outs. 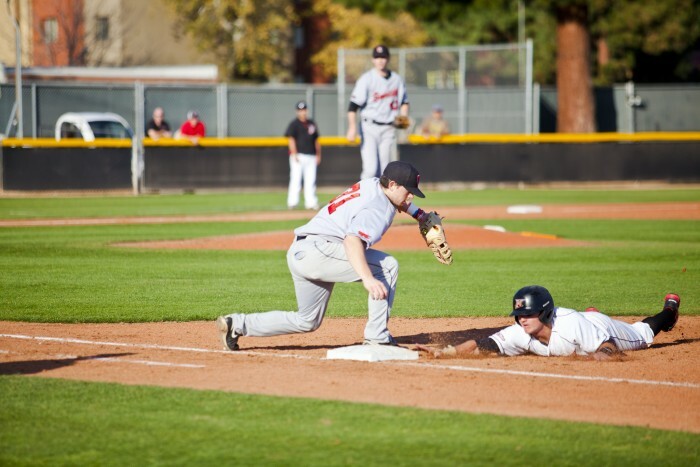 Despite another strong start of the inning, the Dors managed to score only one run off a sacrifice fly ball from Akitoshi, bringing home third baseman Nolan Bumstead. 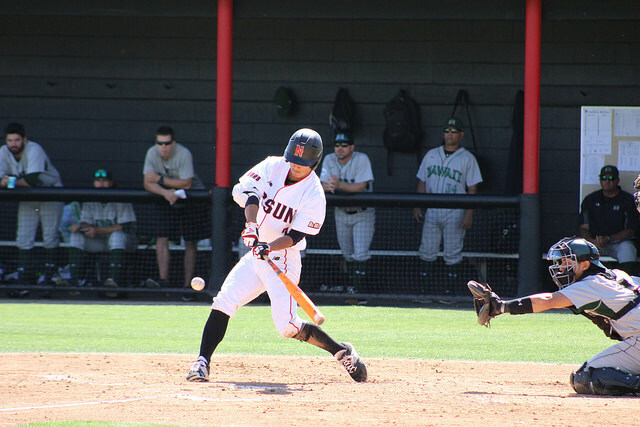 The Matadors shortstop said he believes his first at-bat of every game is the most important. In the bottom of the fourth, Akitoshi registered his second RBI of the game on a double off of the left center field wall scoring Matador catcher, Dylan Alexander, from first base. The two out knock bounced off the top of the wall and rolled away from Hawaii’s centerfielder giving the speedy Akitoshi plenty of time to run out a triple. While he was rounding the bag at second, Akitoshi lost his footing and fell down halfway in between the bases stunting his extra base hit to just a double. Rodriguez continued his reign on the mound over the Rainbow Warriors allowing just two hits and five strikeouts through six innings. No runner advanced farther than second base during that span. 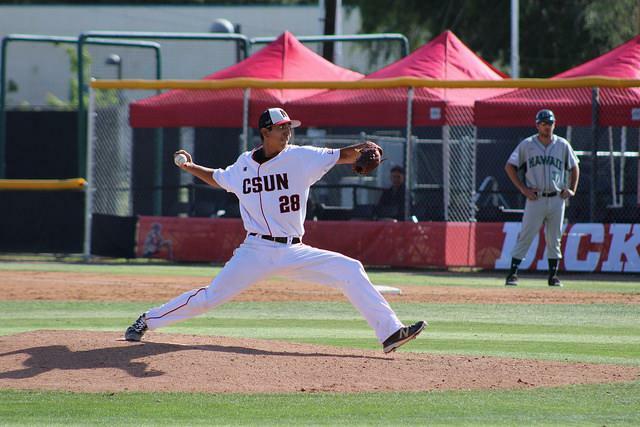 The Glendale College transfer relied heavily on his fastball to get ahead in counts while finishing off Warrior bats with his hard curveball. Rodriguez fell into his first jam in the seventh after a leadoff double by Hawaii sophomore Johnny Weeks. Warriors shortstop, Jacob Sheldon-Collins, followed with a single to rightfield resulting in a first and third situation. CSUN head coach, Greg Moore, made a mound visit during the most pivotal point of the game. With two on and nobody out, Rodriguez started his next pitch from the stretch. In one fluid motion he faked a pickoff move to third and fired over to first to catch Sheldon-Collins off guard. The pick-off throw resulted in a rundown between the first and second base path allowing Weeks to score from third. The Matadors were able to get the safe out and keep their advantage over Hawaii. The strategic play wasn’t planned by the coaching staff. The seventh was Rodriguez’s last, as right-handed pitcher Samuel Myers came in for a relief appearance at the start the eighth inning. Moore made a second call to the bullpen after Myers allowed a leadoff infield single and a sacrifice bunt. With a runner on second base and one out, Matador closer, Connor O’neil, came in for the five-out save. O’neil retired two in a row to end the eighth and continued his dominance in the ninth where he struck out the last two Warrior batters to complete the Matador victory and preserve the win for Rodriguez. Moore said he believes that the back-end of his bullpen is comforting for the team. Moore said O’neil is able to find his footing when he gets down in the count. “He’s just nutty enough to get things done out there and he did it today,” Moore said. Rodriguez improved to 4-3 on the season with a 3.15 ERA while O’neil received his seventh save of the year. 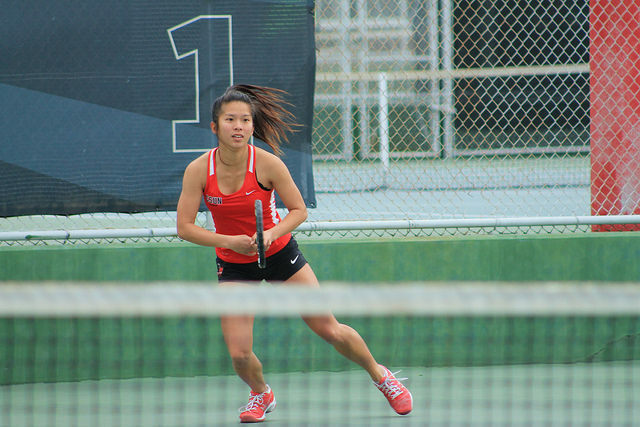 CSUN increased its lead in the all-time series with Hawaii, boasting a 28-15 overall record against the Warriors. The Matadors will host the final two games of the series Saturday and Sunday, both at 1 p.m.